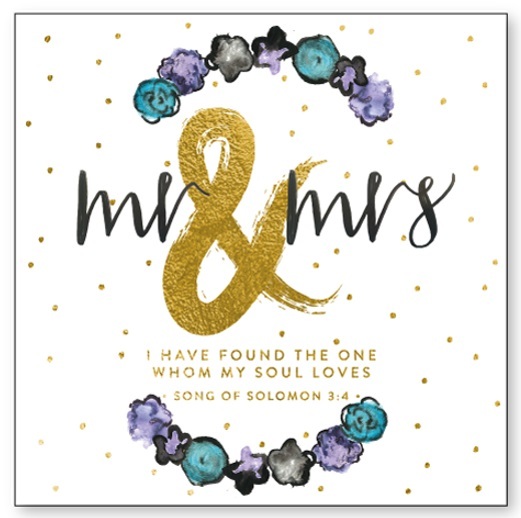 Luxury gold foiled 'Mr & Mrs' greeting card, featuring hand lettering, an original watercolour design and a Bible verse. Part of the beautiful Edna May collection, a range of cards with watercolour designs inspired by my Nanny's vintage scarves. Mr and Mrs Card by More Than Gold Designs was published by More Than Gold Designs in October 2017 and is our 488th best seller. The ISBN for Mr and Mrs Card is GC5MTG. Be the first to review Mr and Mrs Card! Got a question? No problem! Just click here to ask us about Mr and Mrs Card.